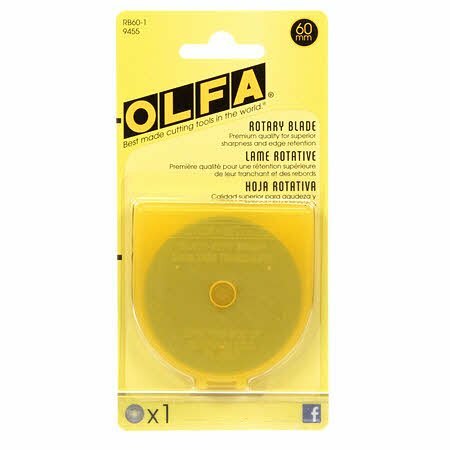 Circular rotary replacement blade for the 60mm rotary cutters used for quilting, sewing, and general crafts. Cuts up to 6 layers of fabric. This blade is made of high quality tungsten carbide tool steel for unparalleled sharpness and superior edge retention. Good For: general quilting, sewing and craft projects. Larger size blade works excellently on heavier weight fabrics or to cut multiple layers with ease. Can be used in industrial applications. For Original 60mm Rotary Cutter (RTY3), Deluxe 60mm Rotary Cutter (RTY3DX) and Quick-Change 60mm Rotary Cutter (RTY3NS).